Version I: As shown. Collection: Library of Congress. 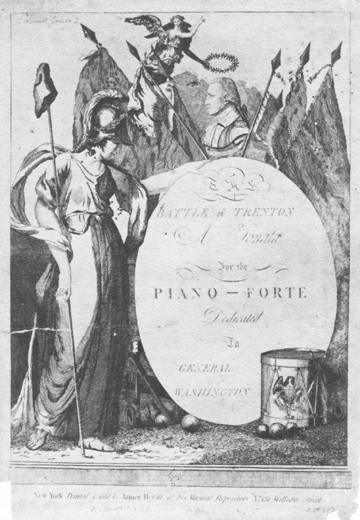 Published in: James Hewitt, "The Battle of Trenton, a Sonata for the Piano-Forte" (James Hewitt, 1797); [trimmed to oval bust and positioned in music title] James Hewitt, "New Yankee Doodle Sung with Great Applause at the Theatre (James Hewitt, [1797-1798]); [trimmed to oval bust] Joseph Hopkinson, "The Favorite New Federal Song Adapted to the President's March" (Philadelphia: Benjamin Carr, 1798).